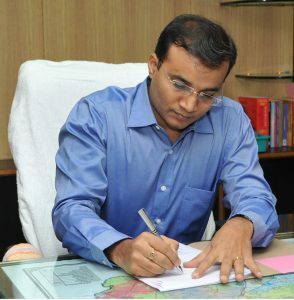 Dr.T.G.Vinay IAS., District Collector and District Magistrate is an officer of Indian Administrative Service belonging to 2009 batch. He is a graduate in Medicines and did his MBBS in M.S.Ramaiah Medical College, Bengaluru. He entered into IAS on completion of MBBS with public service as passion, aspiration and mission. He has immense field experience of working as Sub-collector Namakkal, as Additional Collector (DRDA), Karur and as Deputy Commissioner in Greater Chennai Corporation before assuming charge as Collector, Dindigul. With special interest and focus on water conservation, retrieval and rejuvenation of water bodies and service to physically challenged persons, people are always at the focal point in discharge of his duties.